The Grand Theatre opened in July 1894 and was dubbed “Matcham’s Masterpiece” by Blackpool’s theatrical manager Thomas Sergenson. The four-tiered auditorium is established as Blackpool’s home of high-quality entertainment and is also listed as a Grade II heritage theatre. 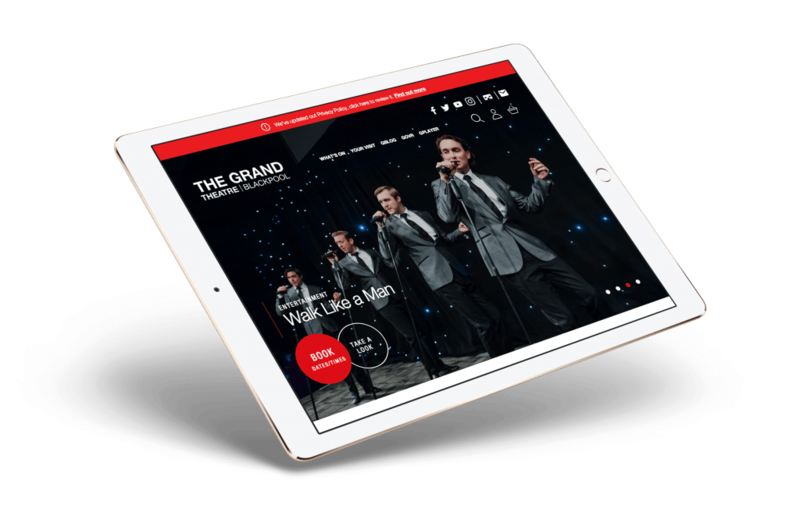 The Grand Theatre required a new website which would complement its enthralling stage acts and modernise the company with cutting edge technology. It wanted to stand out in the industry by making a bold statement about its high-quality venue, whilst putting the needs of its customers first with a clean, accessible, and user-friendly website. The company was eager to cut back on content and present a visual treat for customers in order to truly represent the industry. The Grand also required a new event management system to streamline its procedures for an intuitive UI. These state-of-the-art features needed to complement each other in order for the theatre to continue attracting top talent from across the world. Our research process began with Google Analytics to understand what content visitors were looking at. This identified popular pages and the bounce rates of these respective pages. With tools such as Hotjar, we could establish a detailed analysis of user behaviour which could influence the rest of our design. Our research also included holding surveys with theatre goers to establish industry personas and what they’d like to see on the site. Working closely with the Grand, we agreed the site had to serve and sell, which influenced the design of the wireframes and what could be included in the site’s primary menu. To create a visually impressive website we adapted the theatre’s vivid marketing material. The Grand Theatre’s programmes, brochures, and banners had the distinctive look which would complement the cutting edge website. To include more images and videos of the venue we employed expansive banner areas to promote the theatre’s atmospherics, always a key part to our theatre website design. Our research showed 65% of the Grand’s traffic came from mobile devices. The problem with the old website was it wasn’t mobile-friendly and its loading speeds were slow. As a result, we realised it was essential to develop to be responsive so the Grand Theatre could tap into the influx of users across popular devices such as tablets and smartphones. We developed the site with this in mind first, rather than as an afterthought, so the site can work well across popular devices. Consequently, the site now provides customers with a better UX, whilst providing higher conversion rates as more people take to booking tickets online. Central to the design process was delivering on the Grand's need for a clean website. To do this, we stripped back the landing pages (particularly the homepage) so the top menu features prominently and provides the content we now new customers primarily want to see. To balance out the needs of varying demographics, we featured a mixture of popular productions together. With social media options, there’s now a large calendar which allows customers to easily browse the upcoming shows. To ensure the Grand had industry leading event management software, we worked with Spektrix to link browsing history and customer purchase data to create “Recommended For You” CTAs. Elsewhere, event data is pulled from Spektrix using its API. As a result, the Grand can manage events through its bespoke box office system. The remaining event data is editable through the WordPress CMS, including the homepage slider, video content, image gallery, and Twitter feed, allowing the Grand to easily update event information. In addition, the UX is bolstered with a streamlined booking process and event pages featuring “Remind Me” and “Add to Calendar” options which can be directly added to any calendar users have, such as iPhone, Outlook, or Google. I cannot praise Soap Media highly enough. From understanding the brief to the final delivery, every aspect was considered in meticulous detail. The Soap team were always there, not only in a technical sense but helping us understand more about our online audience, where they were, and what our customers were doing online. Soap wanted to understand our company, the theatre industry, and what our aims are – they got to know us inside out. Our website now stands out in our industry, is visually impressive and dynamic, and more importantly - very easy for all of our customers to use.